Solid plastic polymer is the material of choice where low maintenance and durability are required. Its clean, smooth surface looks professional and is easy to maintain with commercial cleaning agents which can be used without fear of damage. 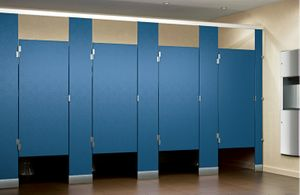 Stalls are water resistant and unaffected by steam or high humidity. Class B flammability rating. Aluminum heat sink strip at bottom edges of doors and panels. Manufactured of high-density polyethylene (HDPE) resins with homogenous color throughout and smooth machined edges. Available with 8" high heavy-duty extruded aluminum hinge for added strength. Prices here are approximate end-user prices & are here to show our low prices. Fax or email us your sketches/plans. Order online & we'll contact you for exact specifications. Orders processed ONLY after your approval. Motor freight shipping will be included in quote. Most popular style. Design is stronger than floor mounted style. Between two walls layout. Plastic shoes and brackets can be the same or a different color than the partitions. Wall to side and back. Plastic shoes and brackets can be the same or different color than the partitions. Two side walls and back wall, Plastic shoes and brackets can be the same or different color than the partitions. No side walls, just back wall. Plastic shoes and brackets can be the same color or a different color than the partitions.